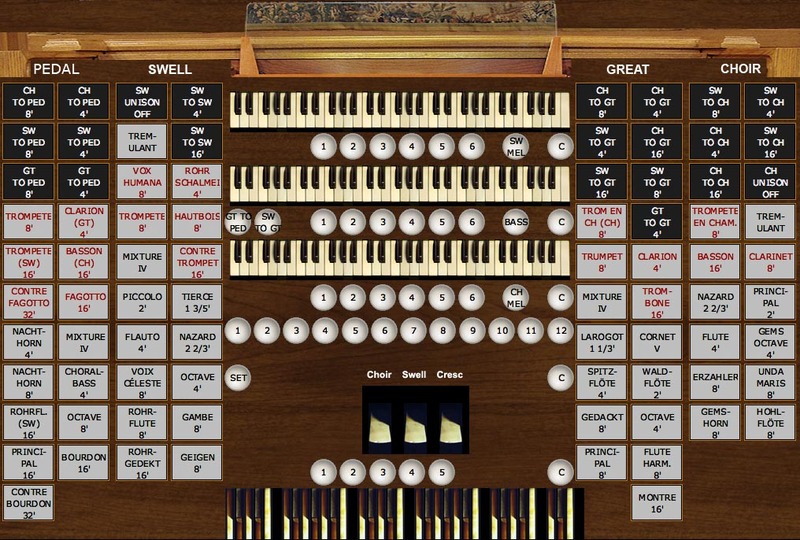 This organ is an expanded version of the popular Hauptwerk "FBR Schantz" organ created by Jonathan Orwig at Evensong Music. The First Baptist Church of Riverside (FBR) Schantz Three Manual Organ has been a favorite Hauptwerk sample set for many years. It is an “American Classic” style instrument with a small amount of reverberation (semi-dry acoustics). My Expanded Schantz Organ recasts the sampled ranks from the FBR instrument into a larger specification that fills in some gaps in the original. There is, however, no unification in the resulting instrument. The new disposition is quite complete for a three-manual American Classic instrument. It retains a definite Schantz sound while not imitating any particular instrument. 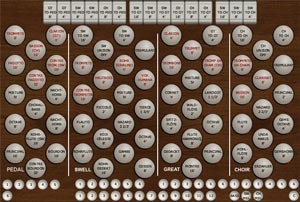 Version 2 of the Expended Schantz Organ has been updated to take advantage of several new features in Hauptwerk 4. It will not run in Hauptwerk 3. 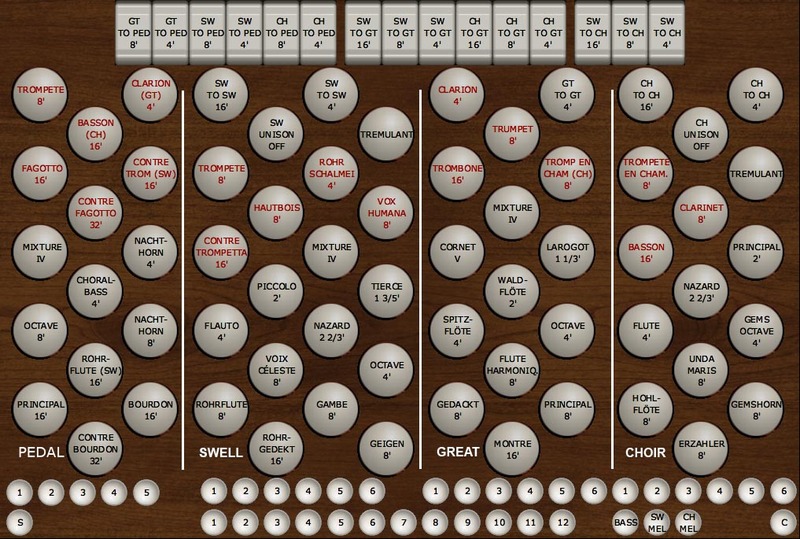 If you do not have Hauptwerk 4, you can still run Version 1.2 of the Expanded Schantz organ. Version 2 sports a crescendo pedal, courtesy of Al Morse's software plus my own special software to massage Al's output into the graphical displays I have created. I have also completely rewritten the tremulants. 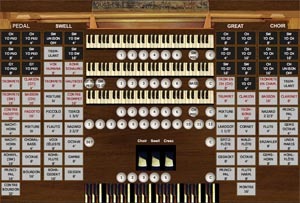 New features were added for Version 1.2 of this organ and retained in Version 2.0. I have added a borrowed Basson 16' to the pedal to give the user a quieter choice of reed. By popular demand, I have added Swell and Choir Melody couplers. These allow stops from the Swell or Choir to be played together with the highest note played on the Great, providing some interesting possibilities. I also added a Bass coupler to the Great. For those of you who are not great pedalers (or who have to accommodate other organists with this deficiency), this takes the pedal stops and plays them from the lowest note on the Great. Some borrowing of ranks between divisions was used and this is indicated on the stoplist. The Vox Humana was moved from the Choir to the Swell. The 2’ Principal was moved from the Swell to the Choir. Several stops were created by combining pipes from two of the original ranks, transposing as appropriate, and carefully working the transition notes in amplitude. These new stops are the Swell 8’ Geigen and 4’ Flauto, and the Choir Gems Octave. The Choir 8’ Hohlflote uses the samples from the Swell 8’ Rohrflote. In order to keep them from sounding identical, I brightened the Choir stop and made it a different volume level. Since there is no unification, one can couple these two stops together to create a flute ensemble. I also added the remainder of the standard American Classic couplers. Here is the crescendo setter page. 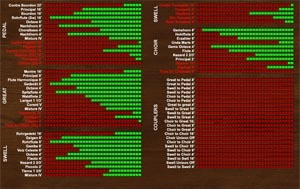 Simply click on the lights to change them from red to green. 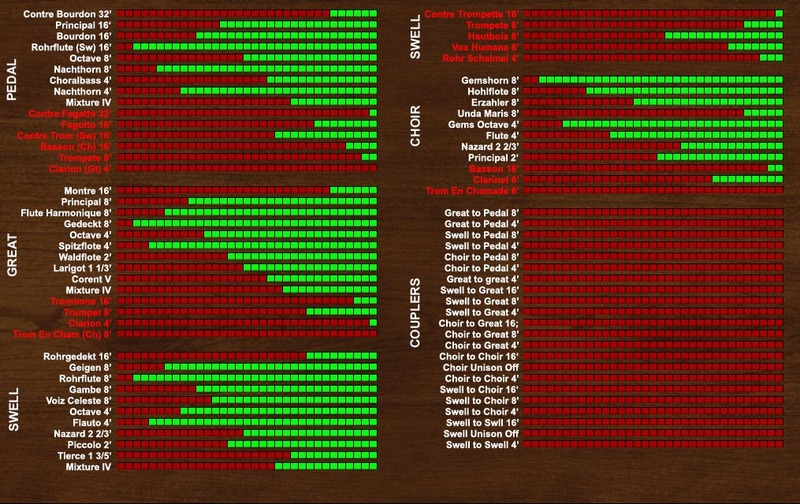 Green indicates that corresponding stop will be "on" at the appropriate crescendo stage. This one is optional. I provide the source code for the Hauptwerk editor so you can see how I did all this and get ideas for your own projects. You will have to rename this file after downloading to "Les-SchantzV3.CustomOrgan_Hauptwerk_xml." I could not get the download function to work properly with the new extra-long file extension required by Hauptwerk 4! Since the CODM cannot generate the crescendo pedal, I included version 1.1 of the organ here (identical except for the crescendo pedal). You can add a pedal back using Al's software, but you will not get the same display I have used in Version 1.2. This organ is an exceptional value. You get ~60 ranks for $100 (I get nothing - but I have great a day job.) The organ is very complete and makes no compromises. It works well with many different genres of organ music. The samples are "only" 16-bit so the entire organ fits easily into a 3 GB system. It runs very well on my MacBook Pro laptop with no measurable latency whatsoever. Remember that Hauptwerk's internal arithmetic is much deeper than 16 bits so the ensembles are accurate to many more significant bits. These samples were recorded in a live acoustic, but the hall is very dry. I add some simple delay reverb to the organ - using my Rodgers' own internal reverb. The total effect is wonderful. You can hear some demo recordings of this instrument on my organ recordings page. I have chosen pieces that show off the many variations in tone color that this organ can produce.